Marvel movies know what they’re doing: clear action, sharp performances, and intelligent screenplays. Of course, the studio is allowed their mistakes after so many successes (here’s lookin’ at you, Iron Man 2), but more often than not, Marvel nails it, especially in their set-up for the long awaited Avengers film. We’ve had Iron Man, Black Widow and The Incredible Hulk, we’re getting Captain America, and now we have Thor – the god of thunder. Not just thunder, but lightening and fertility and strength (thanks, Wikipedia). And if anyone can embody fertility, strength, and inclement weather, it’s Chris Hemsworth. Tall, blond, beefy – he has to be the ideal casting – and in a film racked with political intrigue, light hearted hysteria, and Shakespearean grandeur, Kenneth Branagh has to be the ideal director. The film opens on Asgard, a powerful kingdom in another world, where the respected king Odin (Anthony Hopkins) has two boys who both want the throne: the wry and clever Loki (Tom Hiddleston) and the arrogant and brutally strong Thor (Hemsworth). Thor is a proud warrior with a group of great friends who follow him into battle against the Frost Giants, a race his father once proudly defeated. Of course, this is against his father’s wishes, so Thor gets stripped of his powers and his only weapon – that famous hammer – and both he and the hammer are banished to Earth through a wormhole. He lands in New Mexico, meeting (read: getting hit by the car of) three scientists: Jane (Natalie Portman), Erik (Stellan Skarsgard), and Darcy (Kat Dennings). His hammer lands shortly thereafter, and the hunt is on for him to get it back, with the help of the scientists. Meanwhile, a war begins to brew on Asgard between the kingdom and the Frost Giants in retaliation for Thor’s invasion. It’s interesting watching Thor adapt to his mortal form and get used to life on Earth. What’s even more interesting is Branagh’s tonal choices for the film – it’s an incredibly light-hearted take, with beautifully designed special effects and 3D, and Branagh knows how to balance the humor (of which there’s a lot) and the drama (which is heavy). Even when directing Hamlet back in ’96, he had a strong grasp on finding humor in tragedy, and vice-versa. For a glimpse at the very dark side of his humor, and a better look at his directorial talents, check out Sleuth (2007) with Michael Caine and Jude Law. Most impressive, regarding the effects, was the use of the 3D format. I know my readers; they’re thinking “Wait … he actually liked 3D?” And yes, I did. It served its purpose, this time; the film was dimly light, but the 3D action was clear and didn’t distract from what was going on. 3D usually just makes a film darker, and this wasn’t the case here. The performances are what sell films like this. Iron Man had one of Robert Downey, Jr.’s strongest performances in years; Edward Norton brought loads of empathy to the Hulk. 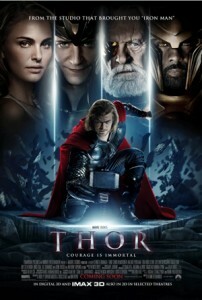 Chris Hemsworth makes Thor believable, despite the utter unbelievability of the character and story in general. He plays Thor like a child, somewhat – maybe just a brash teenager with too much power – and learns to be the hero he needs to be. Natalie Portman might as well be a Disney princess, but her Jane Foster’s infatuation for Thor is tangible, and they make the sweetest couple. Stellan Skarsgard and Kat Dennings have incredible chemistry as a comedic team, and Skarsgard can steal scenes from anyone he chooses; he’s a powerful actor. Anthony Hopkins mangles a bit of scenery, but his character is larger than life, so that might come with the territory. Smaller performances, however, truly seal the film together. Idris Elba has a small role as a castle guard, and leaves a haunting impression. Rene Russo comes back to the big screen as Thor’s mother, and while she’s barely noticeable, she provides what is basically a cameo with enough to be effective, without being distracting. It’s good to see her again. Colm Feore gives a frighteningly smooth performance as the Frost Giant King Laufey; he’s slimy and slippery with evil. Jeremy Renner’s Hawkeye is also introduced, and Clark Gregg is back from the Iron Man movies as Agent Coulson, the leader of S.H.I.E.L.D., who is looking for Thor and the hammer. You know it’s an Avengers movie because Coulson makes a few jokes at Tony Stark’s expense. An example of the film’s light hearted tone: Thor and the three scientists are in a New Mexico diner, and Thor runs out of coffee. “This drink is delicious! More!” he shouts, and slams his mug on the ground, like a Norse god might when demanding more wine. Portman’s instantly maternal reaction kicks off the start of a beautiful friendship. Another example: the discovery of the hammer lodged in a rock in the middle of the desert leads to a series of Sword and the Stone-like attempts to pull it out. There’s a cameo you don’t want to miss there. And, as per usual for Marvel, there’s a scene after the credits that sets up a following film. I’m looking forward to seeing more of Chris Hemsworth, hopefully not in too many Thor movies, as he has the talent to not just be an action hero; and if there is another Thor movie, I’d love for the same cast to come back, with Branagh directing them again. I think maybe I’ve just been spoiled, but the whole project would just feel different otherwise. This is the best of the Avenger films since the first Iron Man, and one of the best superhero films I’ve seen in a while. It makes up, certainly, for The Green Hornet, and is a hell of a start for the superhero season. Captain America comes out soon, The Green Lantern after that, then the Spider-Man reboot … even if they wind up being terrible, at least we have Thor to fall back on. And who better to rely on than him?